Nine stories about exiles, emigrants, and wanderers uprooting their families from the Philippines to begin new lives in the Middle East, the United States, and elsewhere. [Alvar's] book, as Walt Whitman might say, contains multitudes — not just because of its varied settings, from the Philippines to the U.S. to Bahrain, but because every character is different, and portrayed with love and a rare kind of understanding ... Alvar finds beauty in the unlikeliest of places, and that's what makes In the Country such an inspired, remarkable book. Her characters, even the lucky ones, are never far from affliction, and never really close to home, even when they've lived in the same place their whole lives. Alvar finds triumph in the torment and deliverance in the agony. As in a good Tagalog movie, twists abound in Mia Alvar’s debut collection. But Alvar’s finely wrought shocks, delivered in exacting prose, reverberate without easy resolution ... Alvar’s incursion into Filipino politics recalls Jessica Hagedorn’s novel Dogeaters, and Miguel Syjuco’s Ilustrado. But stylistically, Alvar’s elegant examination of the political wife is reminiscent of the long-suffering spouses and familial enablers of political men in Nadine Gordimer’s fiction ... After the earlier stories’ gripping tension, the muted pace of the novella 'In the Country,' told through date-stamped vignettes, is initially jarring, then thoroughly heartbreaking. Debut story collections don’t come much better than this. 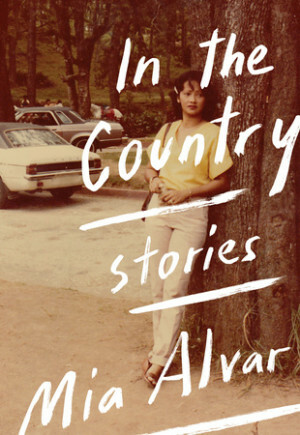 In the eight complex tales and one ambitious novella of In the Country, Filipina-American author Mia Alvar proves herself a tough, sophisticated writer with a canny empathy for the quandaries that confront her intricately layered characters. What did you think of In the Country?